As Colorado's historic experiment with legalized, recreational marijuana approaches end of its first full year, there are a variety of signs the cannabis industry is maturing; especially in the evolution of its marketing and branding. One sure sign is the approach being taken by Denver's Kindman, one of the state's most established and respected marijuana producers and distributors. Kindman has pioneered the first-ever branded and pre-packaged line of cannabis, meant to simplify the selection process for the consumer, as well as easing sales time for dispensaries – while also ensuring both first-time and veteran marijuana users that they are purchasing the safest and best quality products on the market. 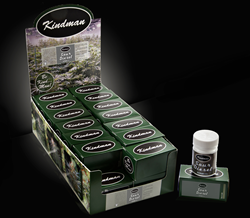 The Kindman brand, with its distinctive forest-green boxes, has been picked up by a number of dispensaries in the state. The result is a unique and attractive Point of Sale display item, in cardboard display boxes that wouldn't look out of place next to the lip balm and other items at the checkout counter of your local drug store. In accordance with state regulations, Kindman uses tamper-resistent, child-proof, opaque bottles for its products. Those different strains of cannabis are packaged into boxes adorned with the company logo, available in 1 gram samplers or in 3.5 gram (1/8 ounce) versions. Both the 1 gram and 3.5 gram boxes are then packaged into one ounce display boxes – one ounce being the maximum amount of marijuana Colorado residents can purchase per dispensary visit. The packaging also allows dispenaries to easily distribute and account for cannabis, according Colorado's current state regulations. But despite that ground-breaking branding, Fox says he hasn't bothered to copyright his innovative packaging. Fox said the packaging, from the food-grade waxed paper inside the bottles (much like cotton in a pill bottle, but cotton sticks to marijuana buds) to the Kindman logo prominently displayed across the individual and larger display boxes, was done with a specific purpose. Established in 2009, Kindman provides customers with an unmatched cannabis product – grown in Colorado state-regulated facilties at indoor locations, using a customized process that combines food-grade nutrients and a unique soil mix that brings out the plant's best features. Close attention is paid to product cleanliness, quality, curing and processing. Since the January 1, 2014 start of legalized sales of recreational cannabis to adults in Colorado, Kindman has provided high-quality marijuana flowers to tens of thousands of customers from over 100 countries.